Russia might not be doing much business with the US government right now, but that doesn't mean it's not interested in the foremost symbol of consumerism in America. 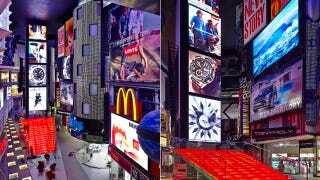 VEGAS Crocus City, a Moscow mall, has unveiled a surprisingly realistic model of Times Square. It even features the forever-swamped TKTS podium—now bereft of crowds. Using the same next generation LED technology that has been used to light world-renowned architectural landmarks as the London Eye, Empire State Building and the Montparnasse Tower – Philips iColor Flex LMX gen 2 – it features 16 million different colors, and can manage multiple media content from a single point.